Musashino was the name of at least one and perhaps two separate Japanese companies making camera elements. 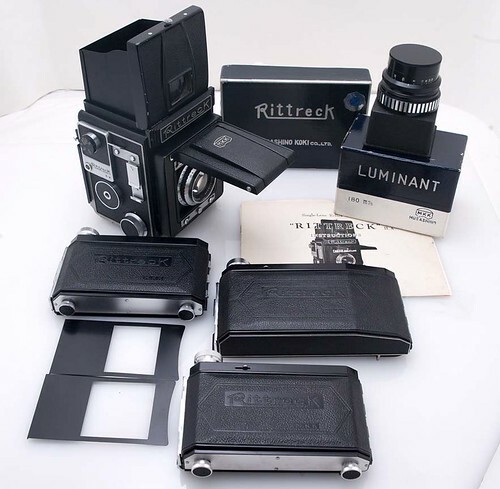 The better known Musashino Kōki made the Rittreck cameras from 1955, and closed its doors in 1972. It resurrected the same year as Wista, which still makes field and technical cameras. Musashino Seisakusho (武蔵野製作所) was a Japanese company based in Tokyo, Itabashi in 1943. It was listed in the April 1943 government inquiry on Japanese camera production as the maker of the Peacock 50/6.3 two-element lens mounted on the Peacock. After the war, the company Musashino Kōki K.K. (武蔵野光機㈱) made the Rittreck cameras from 1955. It is not known if the two companies are related. Musashino Kōki was based first in Tokyo, Setagaya, then in Tokyo, Musashino, whereas the plant was in Kawasaki. The first camera produced by the company was the Rittreck (6×9). Around 1960, the company's headquarters apparently moved to the Kawasaki plant. In 1965, Musashino released the Rittreck View 5×7" view camera. The Rittreck 6×6 was launched in 1968, somewhat inspired by the Pentacon Six. The same year, Rittreck Shōji (リトレック商事, Rittreck Trading) was founded as a separate trading company, to distribute the cameras made by Musashino. In 1969, the Musashino company went bankrupt. The production of the Rittreck 6×6 was handed over to Norita Kōgaku, and the camera was modified and renamed Norita 66. Around 1972, the former trading company Rittreck Shōji took over the production of the view cameras. The same year, it launched the Wista 45 technical camera, and renamed itself K.K. Wista (㈱ウイスタ). 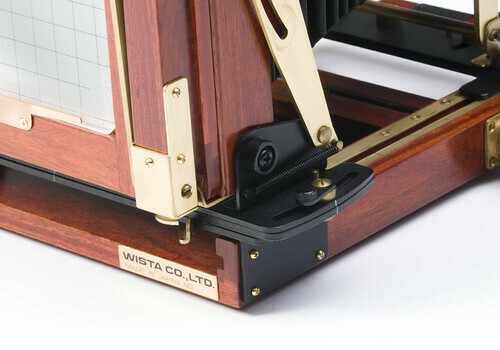 The Wista company still exists (as at 2012), and makes 4×5" technical cameras, wooden field cameras, and monorail view cameras. Wista Field cameras wooden field cameras, mostly 4x5 inch. ↑ Its address in 1943 was Tōkyō-to Itabashi-ku Itabashi-chō (東京都板橋区板橋町) 7–266. Source: "Kokusan shashinki no genjōchōsa" ("Inquiry into Japanese cameras"). ↑ "Kokusan shashinki no genjōchōsa" ("Inquiry into Japanese cameras"), lens item Jd2. ↑ Its address in 1955 was Tōkyō-to Setagaya-ku Matsubara 4–210 (東京都世田谷区松原4–210) and in 1957 it was Tōkyō-to Musashino-shi Kishijōji 1836 (東京都武蔵野市吉祥寺1836). In 1957, the plant was in Kawasaki-shi Shinjō Nagashima 472 (川崎市新城長島472) Source: advertisements dated September 1955 and December 1957 reproduced in Kokusan kamera no rekishi, pp.209 and 322. ↑ The advertisements dated 1961 to 1965 reproduced in Kokusan kamera no rekishi, p.323, only show the Kawasaki address. ↑ 5.0 5.1 5.2 Wista company history. ↑ List of Wista products. ↑ Advertisement in Asahi Camera April 1954, reproduced in Kokusan kamera no rekishi, p.323. The "Shinox" spelling is inferred from the katakana シノックス. Hagiya Takeshi (萩谷剛). "Norita 66: Yūshutsu o mein toshita 6×6 cm-ban ichiganrefu" (ノリタ66　輸出をメインとした6×6 cm判一眼レフ, Norita 66: A 6×6 SLR mainly for export)). Chapter 4 of Zunō kamera tanjō: Sengo kokusan kamera jū monogatari (ズノーカメラ誕生：戦後国産カメラ10物語, The birth of the Zunow camera: Ten stories of postwar Japanese camera makers). Tokyo: Asahi Sonorama, 1999. ISBN 4-257-12023-1. Originally published in Kamera Rebyū: Kurashikku Kamera Senka (カメラレビュー クラシックカメラ専科) / Camera Review: All about Historical Cameras no.18, October 1991. No ISBN number. Sengo chūhan kamera saihakken / Besuto-hansai 3×4cm-han no miryoku (戦後中判カメラ再発見 / ベスト半截3×4cm判の魅力, special issue on postwar cameras and on 3×4cm cameras). This page was last edited on 16 June 2012, at 15:58.